Conservative Writer David French Asks CRs: "Are You Willing to Be Vilified?" 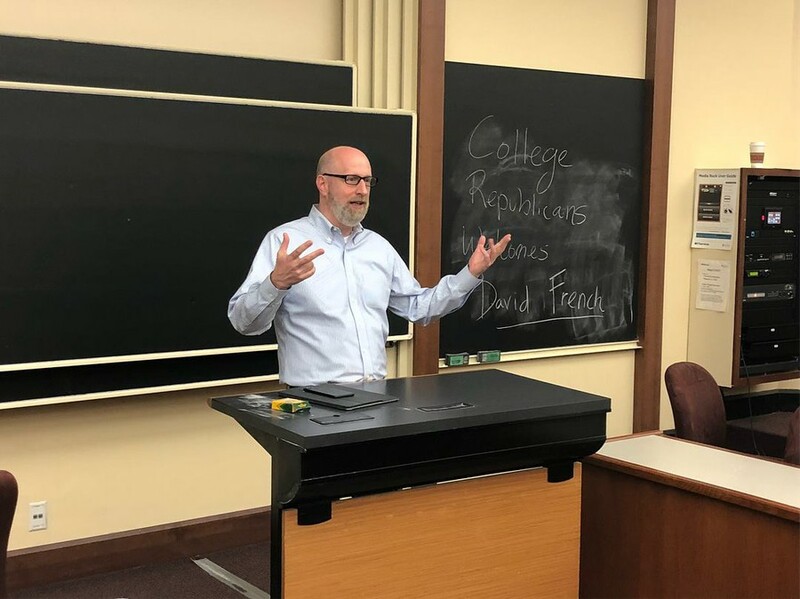 National Review writer and National Review Institute senior fellow David French spoke to the UChicago College Republicans about the state of campus free speech on Thursday night. National Review is a conservative magazine that publishes news and opinion pieces. Prior to joining National Review, French worked with the Foundation for Individual Rights in Education (FIRE) and was deployed to Iraq as part of the U.S. Army. French focused on the way cultural shifts often precede legal and political ones, and the way growing cultural intolerance toward offensive speech may influence future legislation and politics. French opened by contrasting the United States’ nominal attitude towards free speech with its changing reality of increased self-censorship and lower tolerance for center-right views. “As of right now, you are more free to speak your mind than at any other point in United States history,” he said. He noted however, that about 20 percent of those surveyed on campus free speech said that they thought it was appropriate to use violence in order to shut down “hate speech.” Arguing that no real definition for hate speech exists, French used the phrase in reference to speech that offends others based on a “protected characteristic,” like gender, race, or religion. “We’re unlearning liberty,” French said. French pointed toward new social behaviors such as conservative employees of large corporations being afraid to post about their political views to Facebook, or the “speech codes” many universities have attempted to put in place as evidence for a new cultural view concerning free speech. “All of this is not new. It just has burst out of academia,” he said. French later argued that American politics are beginning to reflect culture, a trend he said that can be seen in controversial judicial cases. As an example, he referenced the Supreme Court case Masterpiece Cakeshop, Ltd. v. Colorado Civil Rights Commission, which will decide a business owner’s right to refuse service to gay customers. He also cited California’s disputed Fact Act, which requires anti-abortion medical facilities to post notices about the locations of abortion-providing facilities. French feared that the Supreme Court would affirm the Fact Act’s legality and strike down the Indiana law that allows bakers to refuse service to gay couples. He told those at the meeting that it was their duty to defend the boundaries of acceptable free speech. French emphasized that this defense might involve sparring with PR offices, other students, or even hate mail, as he received some for advertising a pro-life student group while still a graduate student at Harvard.